The cartoonist bemoans his inability to go incognito on a recent trip to San Diego Comic-Con. It would be a poetic death, perhaps, asphyxiating beneath the likeness of his most iconic creation. But he doesn’t want to make the headline writers’ jobs too easy when he finally casts off this mortal coil. The Simpsons will forever loom large over Groening’s existence. Spawning 30 seasons of a nearly universally beloved television program will do that to a legacy. And most recently, the show and its creator have been grappling with the topic of embattled character Apu — which he’s addressed with mixed results and was intent on not discussing on our call. 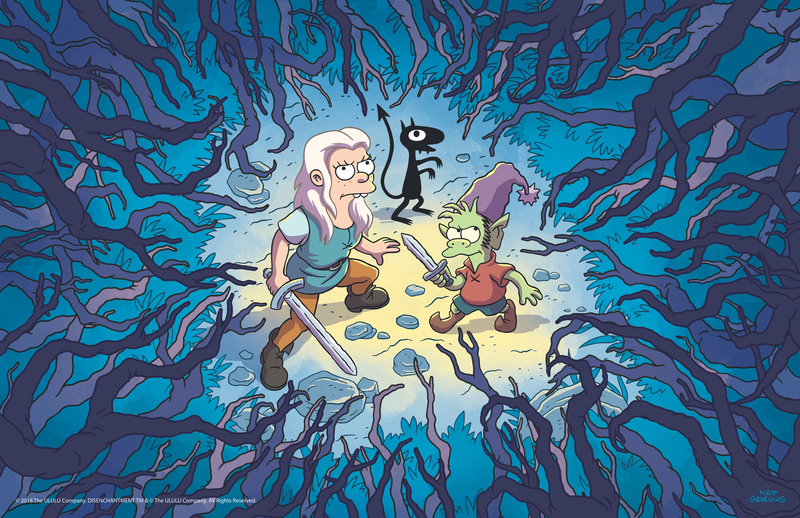 In recent weeks, the artist has been single-mindedly focused on Disenchantment, with one final promotional push before the series makes its mid-August Netflix debut. The show has some seemingly impossible expectations to live up to as Groening’s third animated series. Its predecessor, Futurama, while failing the nearly impossible task of maintaining the ubiquity and longevity of The Simpsons, has become a beloved franchise in its own right, living on beyond its two-network running through constant syndication and an endless stream of memes. 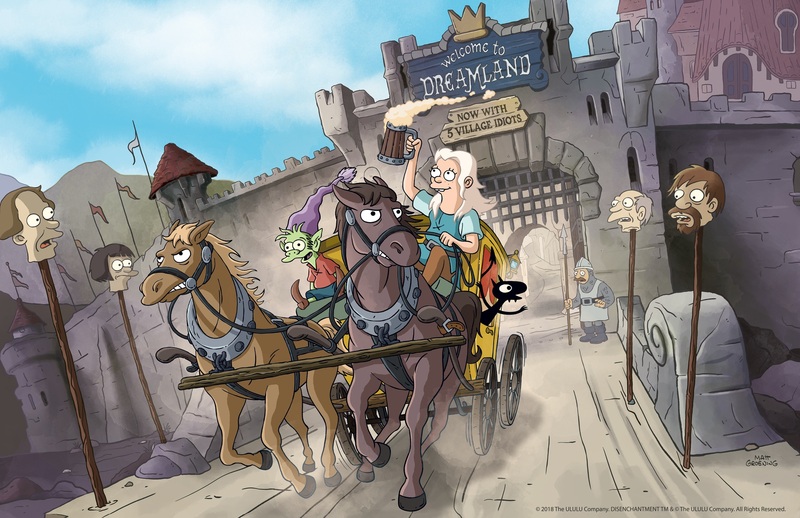 In many ways, the series is Groening’s most ambitious to date, trading in the streets of Springfield and pneumatic tubes of New York for a fantasy world somewhere between Westeros and Middle Earth. It’s a genre he says he’s been looking to tackle for decades, but had never found the right outlet. And while the new series exists in a world familiar to fantasy fans, it rarely butts up against direct parody of beloved properties. An embarrassment of talent should help. The series is helmed by Groening and former Simpsons show runner, Josh Weinstein. Broad City star Abbi Jackson takes the lead as Bean, a drinking/gambling/cursing princess with a fittingly rebellious streak. Comedians Eric Andre and Nat Faxon fill out the primary leads as a “personal demon” named Luci and elf with the decided uninspired name, Elfo, respectively. The rest of the cast is rounded out by a stack of British comedians from series like The Mighty Boosh and The Toast of London, along with mainstay voice actors from his previous series. Groening and Weinstein also poached liberally from the shows to stock the writers’ room. The real secret sauce, however, may be Netflix itself. Along with Amazon and Hulu, the platform has transformed the way television content is consumed, freeing Groening and the rest of the crew from television sitcom constrains that shaped his two previous series. 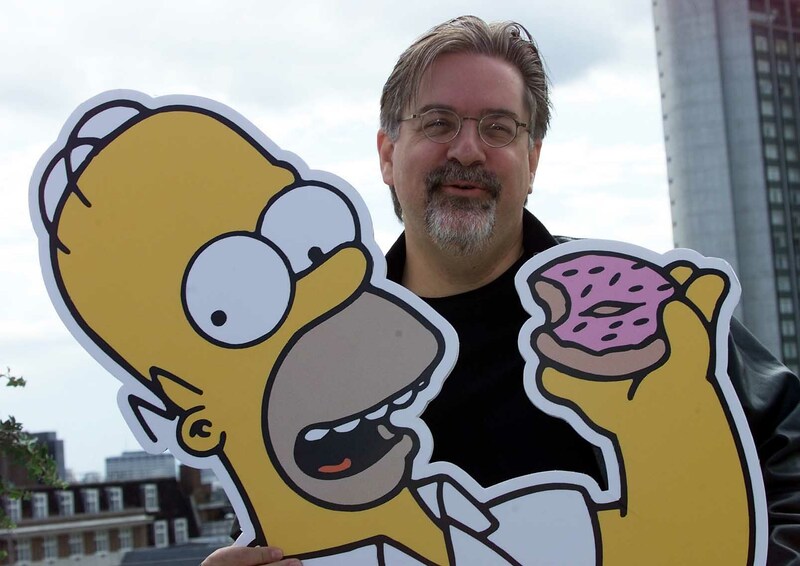 As Springfield Confidential, the new book from longtime Simpsons show runner Mike Reiss reveals, Groening has been interested in long-term character pay-off for some time. It was Groening who pushed for a series ending in which Marge is revealed to be a rabbit — an homage to Groening’s longtime weekly strip, Life in Hell. Oh, and then there’s his big plans to reveal that Krusty the Clown was actually Homer disguised as a way to connect to his son. That was ultimately a too-complicated subplot for the writers to tackle during the show’s early seasons. It’s not a particularly useful hint, so far as those things go, but the artist is clearly happy to prime the pump for enthusiastic fans to comb over the content of the first 10 episodes through repeat binges. If its predecessors are any indication, that sort of rapid fandom ought not be too difficult to stoke. 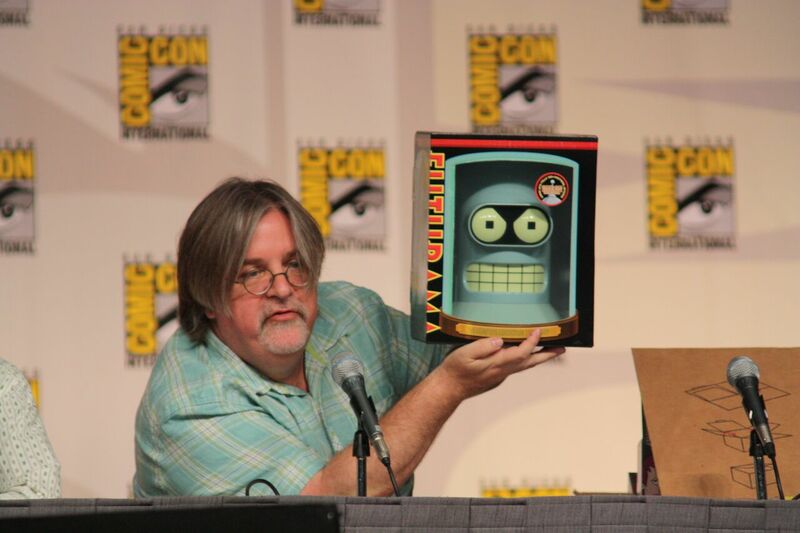 More immediate gratification for Simpsons and Futurama fans can be found in Groening’s unmistakable character design. It’s a bit jarring at first, seeing those icons filtered through a medieval fantasy landscape, but ultimately the aesthetic provides a grounding for first-time viewers. It’s warm and comfortable, like an old coat, and likely to help fans stay invested as the story unfolds gradually over the course of these first 10 episodes. The style has been Groening’s calling card since well before The Simpsons — prior even to Life in Hell, which finally drew to a close in 2012 after a 32-year run. That Elfo looks like a green Bart Simpson in a Smurf hat is the result of something more primordial in the cartoonist’s line work. 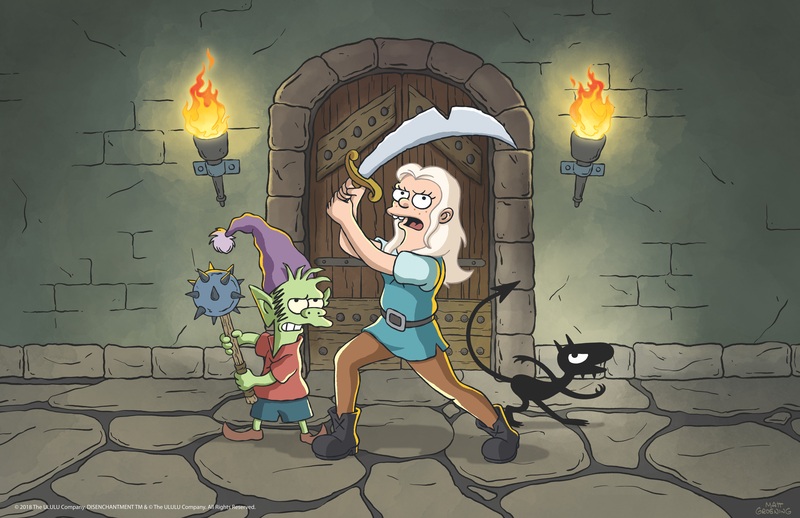 Disenchantment premieres August 16 on Netflix.